Father: cat-man (specific species name unknown. Because of his appearance, cat-man used as a alternative name). She is the class president of Nozomi's class. Her family runs a shrine and she works part-time as a shrine maiden. She has four sisters all younger than her own. The first three younger sisters are triplets and have the appearance of cat-man, despite being half-angel like Manami. 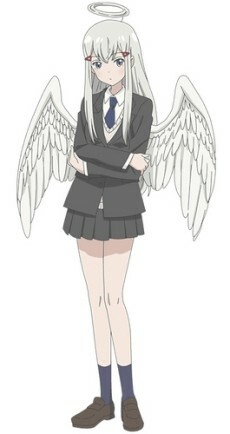 The youngest sister has the appearance of both angel and and her father's species. Unlike Manami, Suetsumi does not have a halo. The halo of angels is not magical in any way. As a matter of fact, it is a hair decorated in a circular shape to promote the angel's culture, similar to how Christians wears crucifixes.